Faust is from Vandières, a small town in the little known Seine-et-Marne, south-west (about 15 miles) from the city of Epernay, and quite close to Paris. These are long-time organic growers, and even though hipster somms don’t know of its existence, you should. What’s more, lovers of pinot meunier champagnes should especially listen up. With about 98% of it inside the bottle and an old-fashioned dosage of 10gr per liter, usually all from one vintage, it is an absolutely delightful aperitif champagne. 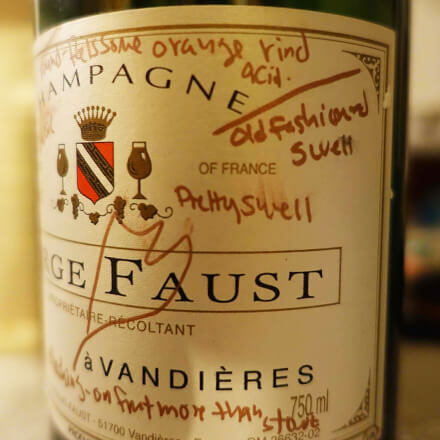 It was very easy going with bitter orange rind-like acid, and has that touch of classic black dress. 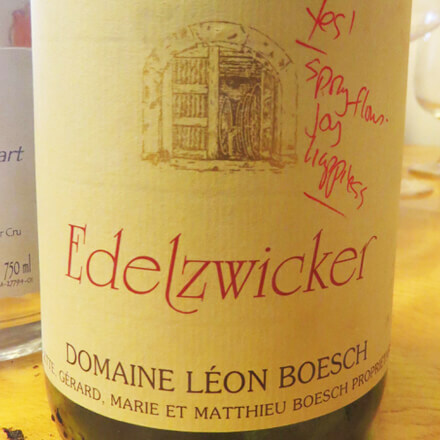 Edelzwicker is an Alsatian wine that is given to field blends. Its name is derived from Edel (noble) and zwicker (blend). At one time it could be only used for wines made from the so-called noble grapes (such as riesling, muscat, pinot gris). Today, anything goes. Boesch works in the Westhalten commune in the Haut-Rhin of Alsace, south east of Colmar. The wine is non-vintage but based on the 2013. I’m in love with everything Boesch and there’s a whole liter of deliciousness here. Raised in old foudres, balanced, peach and peach pit, with a good dose of grapefruit acidity that makes you reach for more.